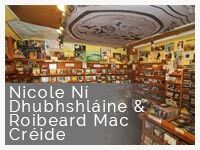 The latest podcasted Sessions from the Shop was recorded with Nicole Ní Dhubhshláine and Roibeard Mac Créide, who are cousins and the youngest musicians to podcast from the Dingle Record Shop so far. Colcúigear is ea iad. Nicole is a 13 year old traditional music player from Tig Áine, An Ghráig, Baile an Fheirtéaraigh. She is in 2nd Year in Pobal Scoil Corca Dhuibhne. She has won many Ceoltas competitions including 2nd in Fonn Mall, Feadóg Stáin All Ireland, 2011. Roibeard is from Leixlip, Co. Kildare and has spent many holidays in Kerry. He made a cd with 7 blind and visually impaired musicians in 2012 called, A Musical Vision, The Blind Tradition. He is studying music and psychology in U.C.C. Music is a huge part of their life's. 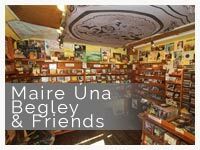 The latest podcasted session from the Dingle Record Shop features Maire Úna Begley on concertina, whose two albums are available in the shop. Maire is joined by Finbar Murphy also playing the concertina as well as the harmonica and Sophie Murphy on flute and whistle. The trio became a quartet when a passing French tourist (Dorian) who happened to be in the shop joined in on the fiddle.. The latest Session from the Shop features regular visitors to West Kerry, the Mandolas. 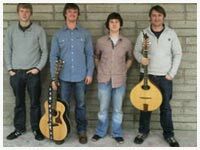 The Mandolas are a 4-piece folk/pop group based in Cork. The band make use of a wide range of acoustic instruments (mandolin, mandola, acoustic guitar, bouzuki, banjo and viola) as well as incorporating lavish 4-part harmonies into their music. The band perform original material and combine Irish and English folk traditions with a unique blend of contemporary pop. This week's session from the Dingle Record Shop has a seasonal twist with the Choir from the Pobalscoil, under the tutelage of Joe Creedon, singing a selection of Christmas and other songs. The poet Maria Ní Mhurchú also gave a reading from some of her work and endurance swimmer Nuala Moore made the long journey from the adjoining premises to share her tales of her Siberian exploits. This week’s podcast from the Dingle Record Shop features one of the most innovative provocative and imitated voices in Irish traditional and folk music Karan Casey. 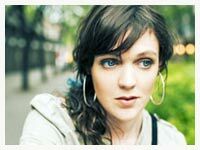 Her career has spanned twenty years from the early days as a jazz performer in Georges bistro in Dublin to her heady days in New York with the band Solas to her now blossoming solo career. She has sold over half a million albums. Karan released her first album with the group Solas, which quickly became the most celebrated Irish band in the US, and her four years with the group were pivotal. This week's podcast from the Dingle Record Shop features Irish-American multi-instrumentalist, vocalist, radio announcer, and songwriter Danny O'Flaherty. As the founder and president of the non-profit Celtic Nations Heritage Foundation, O’Flaherty has hosted an annual festival of Irish music and art since the early '90s in New Orleans. Having been raised in Connemara Danny took his love of music and song with him to America when he emigrated in the early 1970's and has built a considerable reputation as a recorded and live performer. 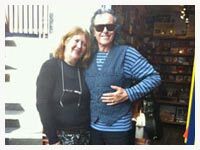 Donovan (born Donovan Philips Leitch, 10 May 1946) is a Scottish singer, songwriter and guitarist. Emerging from the British folk scene, Donovan shot to fame in the UK in early 1965 with a series of live performances on the pop TV series, Ready Steady Go!. Donovan quickly developed an eclectic and distinctive style that blended folk, jazz, pop, psychedelia, and world music (notably calypso). 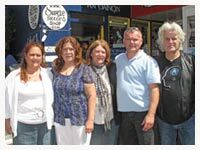 He has variously lived in Scotland, London, California and Ireland, and currently lives with his family in County Cork in Ireland He called in to the Dingle Record shop recently to play a tune. 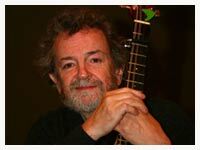 This week's podcast from the Dingle Record Shop on Green Street comes from Legendary Irish singer/songwriter Andy Irvine. Having travelled the world with bands such as Sweeney’s Men, Patrick Street, Planxty, and more recently Mozaik, Andy has always pursued new combinations and styles of music. He dropped in to Mazz on recent visit to Dingle. 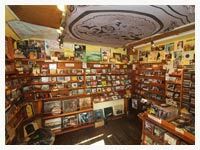 This week's session from the Dingle record shop features well known guitarist and singer John Browne. John, from Tralee, is a regular on the Dingle music scene with a wide repertoire of tunes and often accompanies uilleann piper Eoin Duignan in local sessions. This week's session from the Dingle Record Shop features a true legend of Irish music. Dolores Keane dropped in to Mazz on Green Street for a chat and a few songs. As a founding member of De Dannan Dolores found an international audience with the band before embarking on a solo career. Her recordings of songs such as Caledonia, The Island and Jimmy Mo Mhíle Stór cemented her reputation as a uniquely talented vocalist. On a recent visit to Dingle the multi instrumentalist dropped in on Mazz with her Harp to play a few tunes. 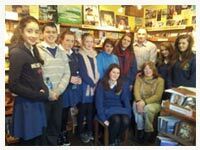 The latest podcasted 'Session From The Shop' from the Dingle Record Shop was recorded with Mark Geary. The Dublin born singer songwriter honed his craft in the clubs of New York having emigrated there in the early 1990’s. His songs have been featured in films and television and he has released a number of critically acclaimed albums including 33 1/2 Street and Ghosts which was voted album of the year in 2005 by The Irish Voice.